Present your loved one this Blessing of Spring Valentine Gift Combo on the auspicious occassion of Valentine's Day and let your beloved taste the real flavor of your love. 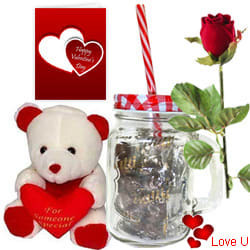 This stunning Gift Combo is accommodated with 1 Jar full of Crunchy Cadbury Nutties Chocolates, 1 Velvet Rose, a Love Message Card and a lovable small Teddy. Flowers Delivery Delhi, Send sweets Hosur, Wedding Cake Kozhikode, Diwali Mithai Baroda, Send Flowers and Gifts to Moga, Online Shop Gandhidham, Flower to Goa, New Year Flowers Madanapalle , Fresh Fruits Tanjavur, Send Gift Gorakhpur, Dry Fruits to New Delhi, Birthday Delivery Jamnagar, Sending to Bhagalpur, Flower shop Hyderabad, Bhiwadi Online Cake Delivery.